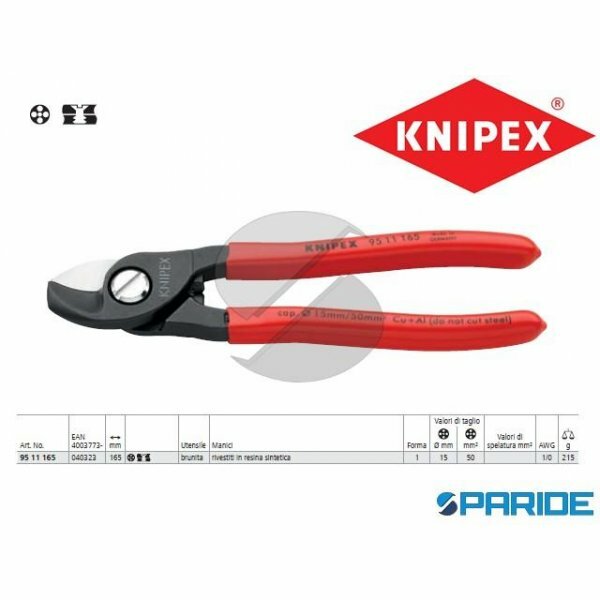 CESOIA PER CAVI 95 11 165 KNIPEX. CESOIA CON MANICI IN RESINA SINTETICA. 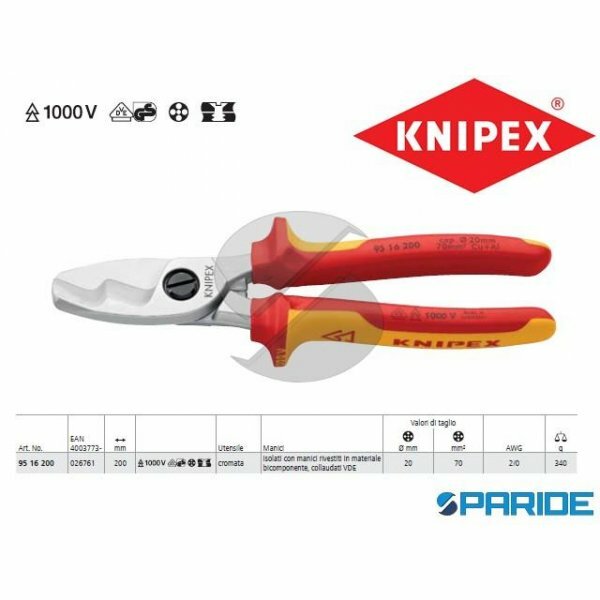 PER TAGLIARE CAVI IN RAME ED ALLUMINIO UNIPOLARI O A PIU FILI; NON UTILIZZABILI PER FILO DI ACCIAIO E CAVI ..
CESOIA PER CAVI 95 16 200 KNIPEX. CESOIA CROMATA CON MANICI ISOLATI RIVESTITI IN MATERIALE BICOMPONENTE. 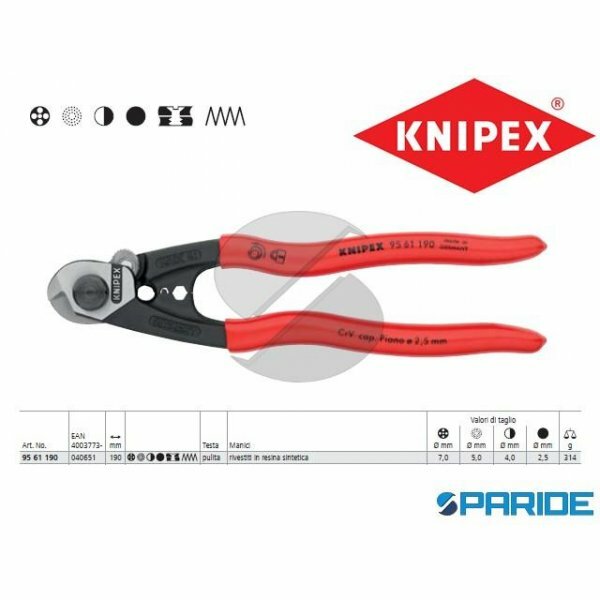 CESOIA PER TAGLIARE CAVI IN RAME E IN ALLUMINIO; NON UTILIZZABILI PER FILO ..
CESOIA PER FUNI E CAVI ACCIAIO 95 62 160 KNIPEX. COMPATTE, LEGGERE E POTENTI FINO AL 30 PER CENTO DI MINOR SFORZO RISPETTO ALLE CESOIE PER CAVI, FUNI E TREFOLI D ACCIAIO DI UGUALE ..
CESOIA PER FUNI E CAVI DI ACCIAIO 95 61 190 KNIPEX. CESOIA CON DUE PROFILI DI CRIMPAGGIO PER CAPPUCCI DEI CAVI BOWDEN E TERMINALI DI FUNI METALLICHE. 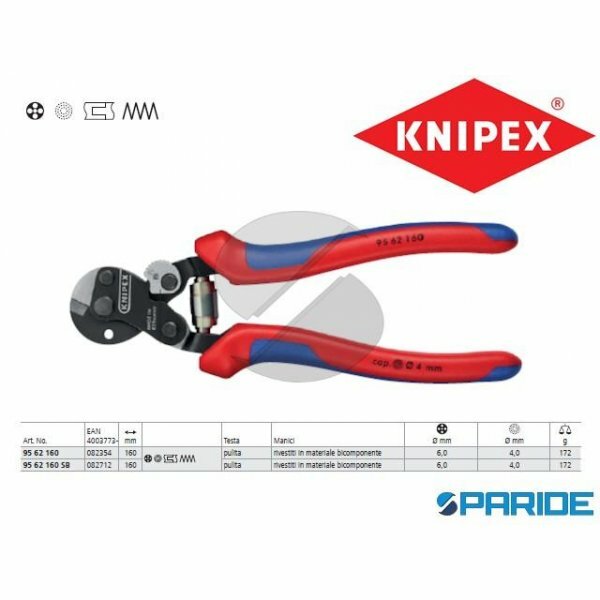 LAVORO CONFORTEVOLE GRAZIE ALL..
CESOIA PER TIRANTI FLESSIBILI 95 61 150 KNIPEX. CESOIA BONDERIZZATA NERA TESTA PULITA MANICI RIVESTITI IN RESINA SINTETICA. PER TIRANTI FLESSIBILI E FILO METALLICO DOLCE (ANCHE V2A..